Last day of our mammoth cycle ride and ONLY 35 km today. Was very glad that we had elected not to carry on to Venice because Italy was experiencing very hot unseasonal weather and they were expecting 40oC today after an exceptionally hot day yesterday. Well, today nearly killed both of us (I wrote in my diary “I never want to see that bloody bike again”). Our morning route was quite pleasant that took us through rolling countryside with grapes, peaches, apricots and lots kiwifruit and what made it even more enjoyable was that we were away from the main roads for a few hours. We then caught our first sight of the Adige Valley and the approach to Verona. 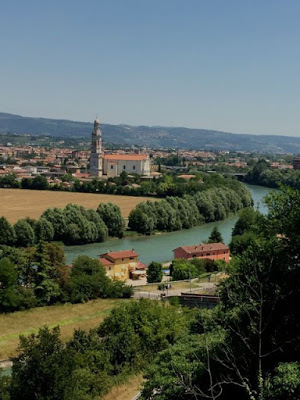 It was very hot which was exacerbated by the fact that we were out in the sun for most of the afternoon, with very little shade, as the bike track came down out of rural Veneto to follow the Adige Canal into Verona – bitumen and concrete and no trees. Several times during the afternoon, found me lying down on a foot-wide piece of road-side verge, amongst all manner rubbish and some things I can’t bear to think about, in the shade, feeling quite nauseous and about to blow a gasket. 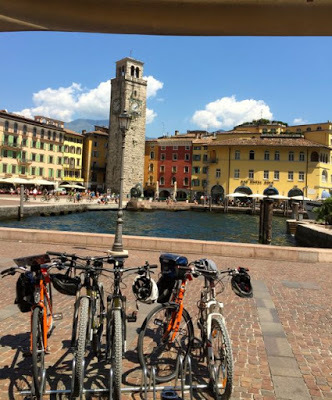 Excitement and frustration was mounting in equal measure as we headed for our final destination – it was 25 years since I had last been to Verona and me cycling mate had never been to Italy before. He has had had to listen to me, though, banging on about it with a far away, dreamlike look in my eyes. I had gone there in 1990 to sing Verdi’s Requiem with Pavarotti in the Arena de Verona (me and 3,000 other choristers – but it sounds good doesn’t it) – and having been one of the most memorable experiences of my life, I was almost scared to go back lest the spell be broken. 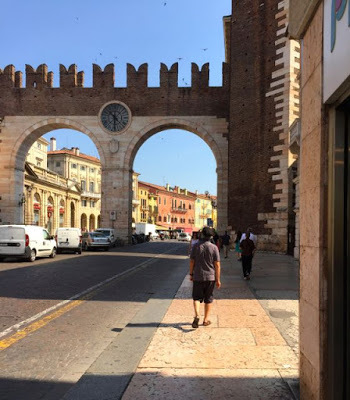 Our difficulty with the heat today was compounded today by the fact that the tireder we became, the busier the roads as we approached Verona, and we had to negotiate screaming autostradas via lengthy detours and underpasses. On top of this, when we finally got there,we discovered that our hotel in Verona was outside of the old town and could only be reached after traversing two motorways – we could see it’s multi-storey edifice like a beacon in the distance – but do you think we could work out how to get to it? Finally we made it to our room in the Hotel Leon D’Oro. 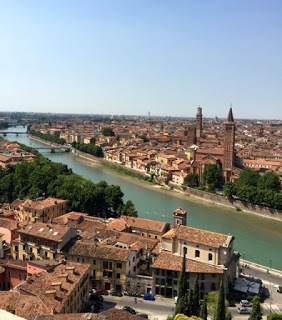 I chucked my cycling shorts in the bin, had a shower, ordered room service and collapsed in bed for about twenty hours – Verona would have to wait. Fortunately we had booked an extra couple of nights before having to catch a flight back to Athens from Milan. So relieved to wake up and realise that we had made it and I didn’t have to; get our bags ready for forwarding to the next hotel by 8am, put on my cycling gear, eat another stale croissant that I had found in the bottom of my pannnier when I was starving and miles from anywhere and – more importantly, get back on the bike again and cycle the 75km to Venice – yeah!! Bonjourno Verona! Although it was very hot again 38oC, we did our best to see as much as possible – starting out where my memories were kept and walked to the Arena, built by the Romans in1st century AD, and Piazza Bra where it was in full tourist and opera season. 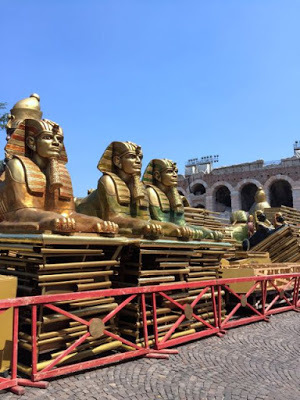 There is no room in the Arena building to house the lavish sets for each production so they are just kept out in the Piazza – like these props for the upcoming Aida concerts – fortunately it doesn’t rain much at this time of year! 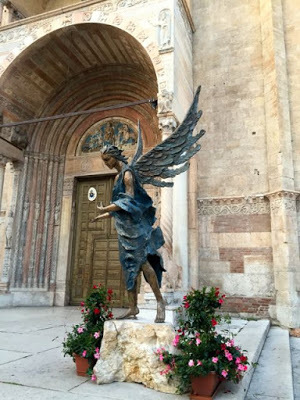 Verona is an art lovers paradise that rivals Venice – you just need the energy to explore it’s treasures. We decided that taking the city tour bus was the best option on a day like today – and it was wonderful – we saw lots of parts of the city that I had never seen the first time around. Hopped off when we saw a trattoria that had big fans with vapour mists blowing over the diners – tops! 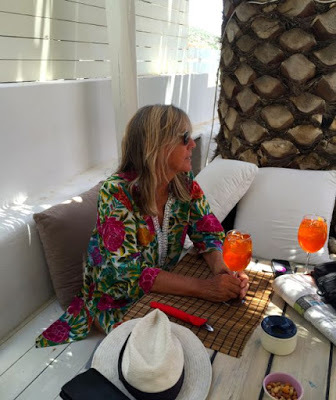 An insalata caprese and Aperol Spritzer fortified us for the afternoon session on the bus – then a very long siesta before dinner. We took a taxi late to the Duomo area – the loveliest part of the city I think. It was cool enough now to enjoy wandering around the beautiful cathedral and soak up the atmospheric back alleys and glorious buildings. Verona was just crawling with tourists and we wanted to find somewhere away from them, where the locals might go – so we headed for the Duomo ‘Slow Food’ restaurant Antica Osteria and were not disappointed. Me mate was happy because they served local wines (and he could ask for corposa – a red wine with the corpse in it) and I was happy because we had a lovely table outside in a gorgeous courtyard seated next to a Veronese family dressed in fabulous style and smelling divine – and that was just the men! And so our wonderful journey had come to an end – would I do it again – of course! 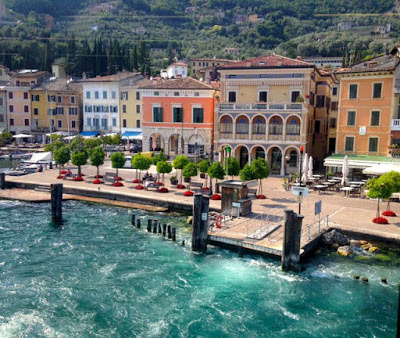 The pressure was on today because we had to get to the ferry terminal at Riva del Garda by 1.45pm and had 50km to cycle. 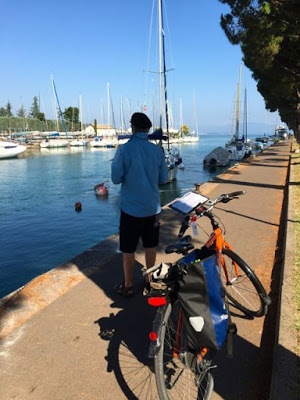 Situated at the northernmost tip of Lake Garda, we had to pick up the ferry from there to take us on a five hour boat trip on the lake to the southernmost port of Peschiera – and there was only one ferry a day so we couldn’t be late. Believe me, my little legs were peddling nineteen-to-the-dozen and I ended up being in a kind of daze for most of the morning, valley hugging the Adige River through fruit farms, vineyards and fields of maize. We set out early – very sad to leave Trento vowing to return one day, but it was a good job we did for today put many obstacles in our path by way of detours and wrong turns – one of which added another 12km to our journey. I was getting seriously overheated as temperatures had risen today to above 35oC and we had several climbs before we could freewheel down to the lake – what a welcome sight that was. Day 4 and I have finally managed to work out the gears on the bike, the saddle height and padding in the shorts to stop numb-bum and the trip finishes tomorrow!! Everything changed today and we knew we were in Italy. Whenever we stopped on the bikes, looking lost, someone would come up to us and offer help – such a welcome change from the unfriendliness we had experienced on the first part of our trip. An old chap in the little village of Marco was typical. “Turn right by the machina bianco – go over the ponta and past the fabrica” and parted with a “how romantic, the two of you on bicycles”. At last I could understand a little of what everyone was saying (my father had been in Italy during the war, learned to speak Italian and spoke to us kids in Italian). How lovely is a smile and a friendly exchange when you are in a strange place – priceless! Lake Garda suddenly appeared beneath us as the Dolomites parted – like a pot of gold at the end of a rainbow – we had an hour to make the ferry. Then the strangest thing happened. 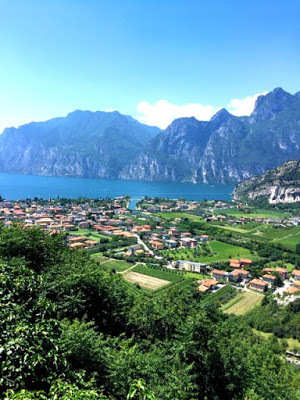 We could see the ferry port of Riva del Garda around the top of the lake to the north with boats chugging in and out but, no matter how hard we peddled, it seemed to get further away – it just never seemed to be getting any closer. 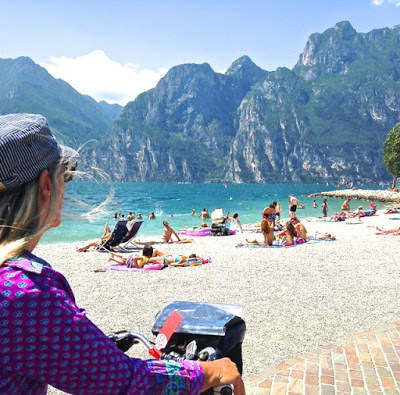 Finally, we dropped down to a bike track that skirted this Italian water-sport playground – it was such a lovely sight, with everyone, young and old, having fun on; surf kites, wind surfs, yachts large and small, peddle boats and stand-up boards. I spotted number plates on camper vans from every corner of Europe and, I could certainly see why they would make the journey here – it was fun and it was warm and there was water and a beach! And we had time for a very welcome Aperol Spritz and handsome prosciutto, cheese and salad panini. We had discovered these very strange looking bright orange drinks in Trento (where they originate from) and they became our pre-dinner drink for the rest of our time in Europe – once tasted, there was no going back. They are made from Aperol vermouth (bitter orange, gentian and rhubarb) prosecco and mineral water with a slice of orange – tops. 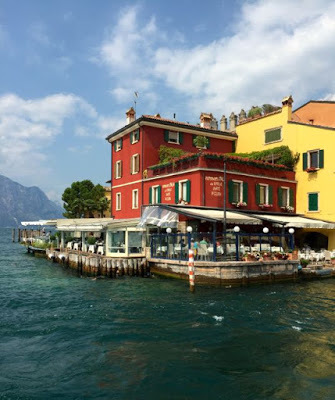 Again, we would have liked more time to look around Riva which was full of fabulous medieval buildings with a beautiful water-ilned piazza but, we had a ferry to catch. The last time I had been on Lake Garda was in 1990 (singing with Pavarotti!) and, while maintaining that charm and beauty I remembered from twenty-five years before, it was just incredibly busy. Traditionally the playground of wealthy Venetians, going back centuries, the shoreline is dotted with elegant villas, draped in scarlet bougainvillea, gardens punctuated with Lombardy cypress trees, and private moorings that sported classy motor cruisers that would probably cost more than my house – all shiny timber and sleek lines. I was waiting for George Clooney to come zooming past flashing a smile and an ad. for Nescafe. There was so much to see that the five hours went in a flash – the fact that they served prosecco in real bubble flutes, albeit plastic ones, may have helped and I spent most of the time just gazing, dreaming and writing my diary. The lake is 50km long, mountainous in the north with reliable winds whistling down from the Dolomites with the accompanying choppy waters, to flat terrain and calmer waters in the south. Italians have been holidaying here since Roman times – and eating and drinking – the area is famous for its lakeside vineyards and fish restaurants. Hotel Puccini in Peschiera turned out to be a rare dud – it definitely did not sing! We met other cyclists on the ferry heading for the same hotel and we turned up like the peloton on the Tour de France – equally as tired and hot as we were, only to be told that the pool closed in five minutes!! I was also looking forward to a swim before breakfast only to find out that it didn’t open until 10am. What is that? I thought hotel amenities were there for the convenience of hotel guests, not the staff. It was also the only place in three months that we were asked to pay for WiFi; there were no products in the bathroom, apart from one minuscule bar of soap that was like trying to lather up putty, and the fridge was totally empty – not even a bottle of water. Fortunately Peschiera itself was another gem and well worth a visit. 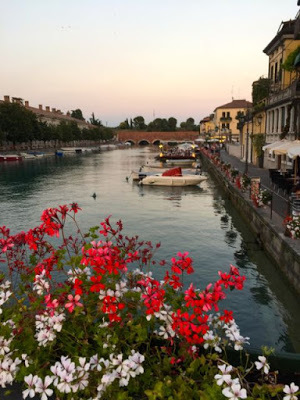 We were back in the land of oleanders, figs, potted geraniums and olive trees that skirted the lakeside esplanade as we walked from our hotel in search of dinner. We found a floating restaurant that was just gorgeous. 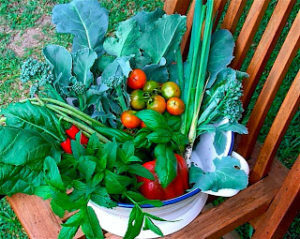 One of the bonuses of being Europe in summertime are the long days – it doesn’t get dark until after 10pm at night and people eat late, enjoying the long twilight and balmy evenings. NOTE: While I go for the prosecco and pinot gris, me mate always drinks red wine and, having zero Italian, was having a bit of difficulty explaining to waitstaff that he likes a full-bodied, robust wine. Paolo, our very nice young waiter in Peschiera, gave hime a good tip – he told him that should ask for corposa – which literally means having the corpse in it!! Even after a few corpses, he still managed to get back on the bike the next day for our final run to Verona.